LEAP is designed to suit your exact requirements. So, if you have a cloud based process strategy or are required to maintain records and data within your own servers, we can deploy your LEAP solution as required. Our experts are on hand to ensure all your technical objectives are met easily and without fuss. Being able to work with your team and your suppliers wherever they are based is a must for any business. LEAP can be accessed via your web browser and is optimised for PCs and mobile devices. It is an accessible option for all businesses, and access levels can be tailored to the needs and appropriate security level of the user. 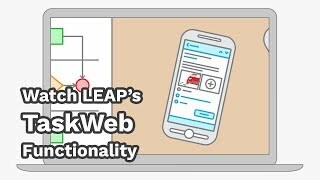 LEAP TaskWeb is a dedicated, fully-configurable, web-based user interface that allows your team members to action their Tasks remotely. TaskWeb removes everything other than the information required for your users to carry out the work assigned to them. When a user actions a Task they will be prompted to complete the data appropriate to that Task. For example, for users who are carrying out site visits and must provide feedback data, or for sending automated authorisation requests to managers for them to respond. TaskWeb also comes in the form of a native iOS App. Users are able to upload images from their phone and each response includes location data so it’s possible to track exactly where a user was when they responded to the Task. Our clients use ProcessWeb to simplify the common process of gathering information from a third-party. This reduces the time spent chasing suppliers for information or updates and removes the time and potential error involved in re-keying data from emails or phone conversations. A key feature of LEAP is the unique ability to include your customers in the process. Usually, information is taken from your customer either via email or over the phone and then this information needs to be re-keyed into your internal system. LEAP removes this additional administration task by allowing customers or your team to input information directly into the system when requested via specialised web forms. The advantages of this are clear – saving time, money and resources.